London Design Festival 2010: this desk is one of seven new pieces to be launched by British designer Russel Pinch at 100% Design this week. Top: PONTUS. 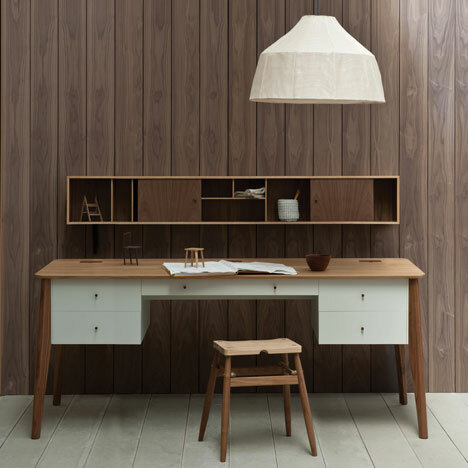 A generously proportioned partner desk combining walnut, oak and painted finish with cable management system and hidden router/hard drive storage built-in. The pigeon-hole unit is available as an option and can be placed directly on the surface of the desk or wall mounted as shown.Above: CLYDE. A 3-legged side table with a turned solid wood top and triangular shelf below. Available in 3 finishes; stained black Elm, Elm and Walnut/Elm combination. The collection also includes these three-legged side tables (above) and wall panelling made from sliced branches (below). Above: ALBA MEDIA. The compact Alba media unit houses a drawer, a cupboard with adjustable shelf and a drop down door to allow remote control access when the technology is in use. 100% Design opens 23-26 September. Above: BRODY. A club chair with refined proportions offering a wide seat and gentle recline whilst assuming a modest footprint. Above: JOYCE SHELVING. A natural line extension to the Joyce cabinet, the shelving unit has soft lines and practical adjustable shelves. Above: TWIG WALL PANELLING. Twig panelling is made from solid Ash forest thinnings and is designed as sculptural wall finish for large interior walls through to smaller alcoves. The panels are hand built to order and can be made to bespoke dimensions. Recommended for interior use. Above: SOREN. The Soren light makes a virtue of its frame, which is apparent through its banana-fibre outer when illuminated. The multi ringed copper frame contrasts with the organic look and feel of the shade itself.